The Sermon on the Mount window, St John’s Church, Langrish, Hampshire, UK. So central is the Sermon on the Mount to the cultural history of Europe, that it is not hard to find evidence of its impact. 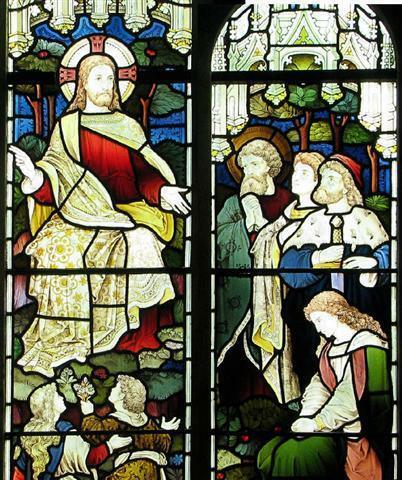 This stained glass captures something of the breadth of its message, for Jesus’ audience includes saints and laymen, men and woman, children and adults. Into one discourse, that we now know as the Sermon on the Mount, Jesus manages to pack the core of his ethical teaching. Recounted in Matthew’s Gospel, his words challenged the world of first century Judaism, provided a moral compass for early Christianity, and, over the past two millennia, have inspired many to a better lifestyle. The Sermon on the Mount promotes a way of life that: embodies the love of God and touches people with it; knows the peace of God and helps others to find it; acknowledges the moral failings of humanity whilst offering solutions to them. This site exists to help you climb the mount, sit with Jesus, and hear, not just the grand sweep of his words, but also some of the more revealing nuances in his language. It will help you appreciate that the Sermon does not exist in isolation, but stands upon the solid foundation of the Hebrew Bible and informs a wealth of later works. Further background, to help answer some of the many questions that might arise when considering the Sermon on the Mount, e.g. what is a beatitude, where is Gehenna, or who was John the Baptist? the details that students need in order to cite the page (this uses SBL Style format, which is similar to the commonly used Chicago Manual of Style). About this site. © R I Kirby 2015, all rights reserved. Terms of Service.